The Hotel de Geneve is only 3 minutes' walk away from the train station and 5 minutes from the city centre and the banks of Lake Geneva. 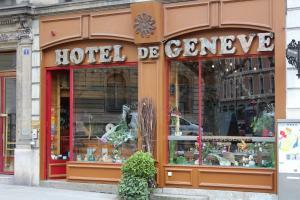 All rooms of the Hotel de Geneve provide double glazing and are therefore very quiet. Start every day at the complimentary breakfast buffet before you set out for doing business or sightseeing in Geneva. Tea and coffee are available for free at the reception from 10:00 to 22:00. Free WiFi access is available in all areas of the hotel and guests also have free access to an internet computer at the reception. Public parking is possible for a surcharge in the immediate vicinity of the Hotel de Geneve.